OPW has been restoring exterior surfaces since 1993. We have successfully restored over 3 Million square feet (7000+ actual jobs completed) of Wood Decks and Brick Pavers. All of the materials used are of the highest quality available on the market today. Free Estimates are available for our Superior Deck Cleaning/ Deck Sealing and Brick Paver Cleaning/Sealing Services throughout the Metro Detroit (Oakland and Macomb Counties), MI area. Please contact us so that our professionals may be able to add beauty and durability to your outdoor investments. All exterior wood needs to be protected from rotting, water absorption, ultraviolet rays, moss, and mildew. If left untreated or neglected your wood could deteriorate costing thousands of dollars in unnecessary damage. At OPW we offer professional cleaning, stripping, brightening, and sealing of all types of wood decks. All exterior wood siding needs to be protected from rotting, water absorption, ultraviolet rays, moss, and mildew. If left untreated or neglected your wood siding could deteriorate costing tens of thousands of dollars in unnecessary damage. At OPW we offer professional wood cleaning, stripping, brightening, and staining of all Cedar Houses, Log Homes, and Natural Wood Siding. Dirt, mildew, grime, and algae can accumulate on your home's exterior and if not removed, it can cause costly repairs or replacements. We offer Low-Pressure House Cleaning. Exterior House Cleaning is needed to restore the beauty of homes that are covered with dirt, mold, algae and other substances. This is effective for cleaning vinyl, aluminum, stucco, and painted brick. Dirt, mildew, grime, and algae can accumulate on your exterior concrete surfaces and if not removed, it can cause costly repairs, replacements, or accidents from slip and fall. We offer Concrete Surface Cleaning. Concrete cleaning is needed to restore cement and concrete surfaces that are covered with dirt, mold, algae and other substances. This is effective driveways, walkways, garage floors, backyard patios, basketball courts, tennis courts, and warehouses. I bought 3 five gallon pails of your Armstrong Clark semitransparent stain. The company that will power wash and stain my deck only needs two pails. Can I return the one we are not going to use? I hope so! If not, how long can a pail be stored? A year or more? Please let me know how I should proceed. Thanks. If unopened you can store for many years as long as it does not freeze. I have a paver patio that is about 10 years old. We have been putting the wet look sealer on about every 2-3 years. We took care of it every year. Now it looks like this. Is there something else to put on it before sealing it that can make it look like new? It looks faded and dull. This is after power washing. Thanks! Try applying Xylene solvent to the area to restore the shine. Spray on with a pump sprayer. I have a flag stone patio, that has the (stone mason) sealer come off over the winter. 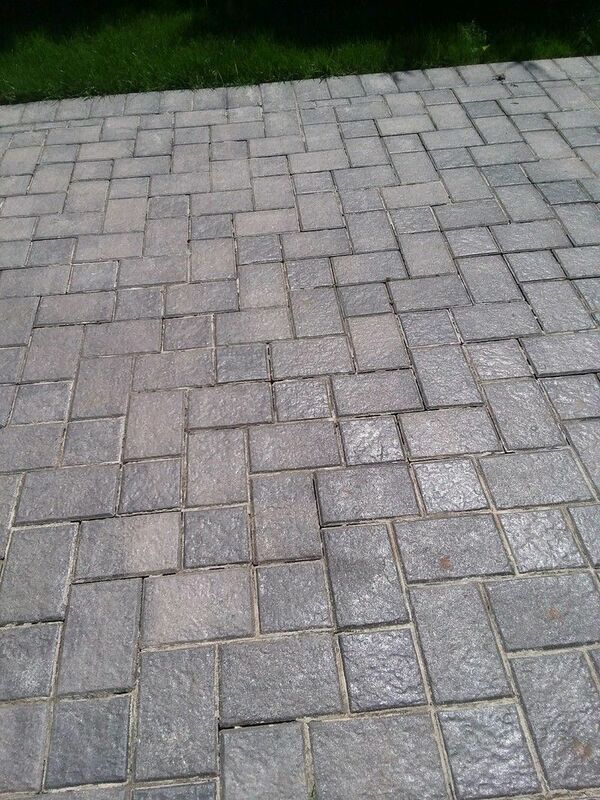 Can use your concrete,paver stripper to remove the res of there sealer. What water based sealer would you recommend to reseal wit? Depends on the brand and type of sealer that was used? Feel free to post a picture as well. I applied Defy Cleaner and then Brightener to my deck but before I could apply the stain (Defy Extreme), it rained (and the forecast is for rain all week). Once the rain stops (and the deck has dried for a couple days), am I safe to apply the stain or is there something else that should be done to the deck prior to applying the stain? You can stain once the rain stops and it dries. Sweep or blow off deck first. I'm in Edmonton Alberta Canada. I believe you ship internationally. I'm looking for product line called DEFY water repellent wood stain. I would like to buy 5 gallons and have it shipped. You can buy directly from this website and have it delivered to Canada. In the past, I have applied stain with a tank sprayer and then brushed it in. I am thinking of using a roller on a pole to reduce wear on the knees. Is that as good a technique? If so, what nap length roller cover would you recommend? The instructions on the RAD stripper say to apply the brightener right away when the deck is still wet from stripping. Is that the only way? What if I wait a day or two and pre-wet the deck before brightening. Would that be OK? No. Best to do it right away to neutralize the stripper. Hello, pricing is in USD. Sorry, but we are not offering any promo codes right now. Hi, I want to order some Armstrong Clark semi transparent stain for my deck but I'd like to see an actual sample on wood. Do you have small sample in ketchup style pouches or very small cans? I'd like to sample Rustic Brown and Sierra Redwood. Is the new Mahogany stain semi transparent? Also, can I mix different stain colors together to get a different color? Veronica, yes we ship to Canada. For cost you would have to add to cart and enter shipping info. Do you ship the Armstrong Clark deck stain to Ontario,Canada? If so how much would the shipping be? I just received a gallon of Armstrong stain. I thought I was getting hardwood stain for an IPE deck. I guess I screwed up the order. I guess I should reorder the product. Can I return the other gallon?